New. 1285737121 New and in great condition with no missing or damaged pages. Need it urgently? Upgrade to Expedited. In stock and we ship daily on weekdays & Saturdays. New. 1285737121 BRAND NEW W/FAST SHIPPING! 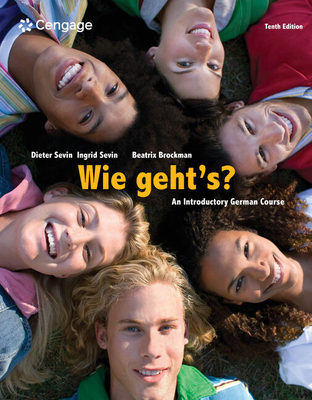 This item is: SAM for Sevin/Sevin/Brockman's Wie geht's? , 10th, 10th Ed., by Dieter Sevin Ingrid Sevin Beatrix Brockman; FORMAT: Bound Book; ISBN: 9781285737126. Choose Expedited for fastest shipping! Our 98%+ rating proves our commitment! We cannot ship to PO Boxes/APO Addresses or outside the continental U.S. To avoid ordering the wrong item, please check your item's ISBN number!